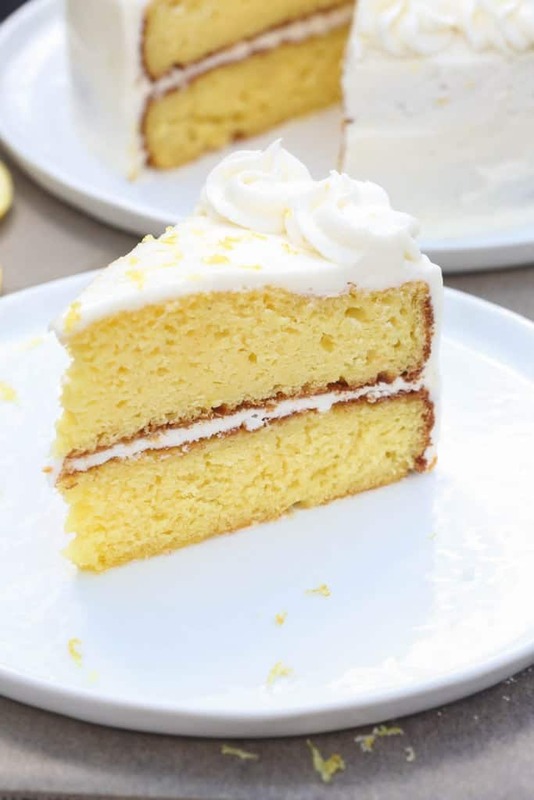 The BEST homemade, double-layer Lemon Cake has a delicious Lemon Buttercream Frosting. A cake lovers’ dream! Don’t miss all of my favorite cake recipes, including my popular Coconut Cake with Pineapple Filling and German Chocolate Cake. Hooray for Friday, and hooray for CAKE! I use weekends as an excuse for baking something delicious. If we’re having friends or family over for a meal I like to make something special, like a beautiful cake. It’s just as easy as any other dessert, and super impressive. When baking cakes I usually bake the cake a few days in advance. I let it cool completely, then wrap it well in plastic wrap and place it in a freezer ziplock bag. Freeze until the day it will be served. I like to make my frosting fresh, the day of serving, but you can also make it in advance and refrigerate it for a few days. By preparing the two parts of the cake this way it makes it super easy and stress-free to put together a beautiful cake! I’ve provided two recipes for this cake for you guys, and I gotta tell you–BOTH are awesome! 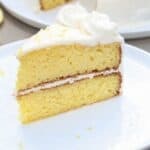 The BEST homemade, double-layer Lemon Cake has a delicious Lemon Buttercream Frosting. A cake lovers' dream! Grease and flour two 9'' round baking pans. Set aside. Sift all-purpose flour and cake flour into a mixing bowl. Add baking powder, baking soda and salt and stir to combine. In a separate mixing bowl add the butter, sugar and lemon zest and mix with an electric mixer until pale and fluffy, about 3-4 minutes. Add the whole eggs and mix well. Add the egg whites one at a time, mixing after each. Stir in the vanilla. Alternately add in a little bit of the flour mixture and then the buttermilk stirring between each addition. Divide batter evenly between the two prepared round cake pans. Bake in preheated oven until toothpick inserted into center of the cakes comes out clean, about 24-29 minutes. Remove from oven and allow to cool several minutes in the pans, then transfer to a wire rack to cool completely. Add the cake mix and pudding mix to a large bowl and stir to combine. Add Greek yogurt, water, oil, and eggs and mix with an electric mixer on medium speed until well combined, about 2 minutes. Pour evenly into prepared round pans. Bake in preheated oven for 24-29 minutes or until a toothpick inserted into the center of the cake comes out clean. Don’t overbake or the cake will be dry! Place the butter in a large mixing bowl and beat with electric mixers for 1 minute. Add 4 cups of powdered sugar, half of the lemon juice and the lemon zest. Beat well until smooth and creamy, about 3 minutes. 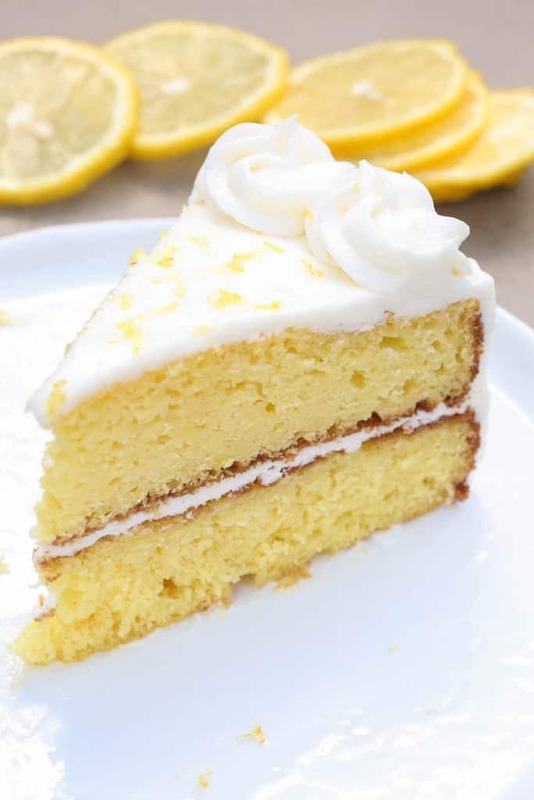 Gradually add the remaining sugar, 1 cup at a time, and the remaining lemon juice until you reach your desired frosting consistency. Frost cake once the cake is completely cool. Lauren, this cake is top-notch to me because it’s LEMON!! Anything baked with lemons is so delicious….so beautiful and ever so fresh tasting, I LOVE LEMON! I do bake from scratch 90% of the time, but a good box recipe, like this one, doesn’t bother me a bit. I plan on making the “from scratch” one first. I also freeze some cake layers in my freezer for future use. It’s quick and easy for those last minute invites to friends homes for dinner. I really like your finishing touch on top of your cake, it’s so cute. Did you say cake? 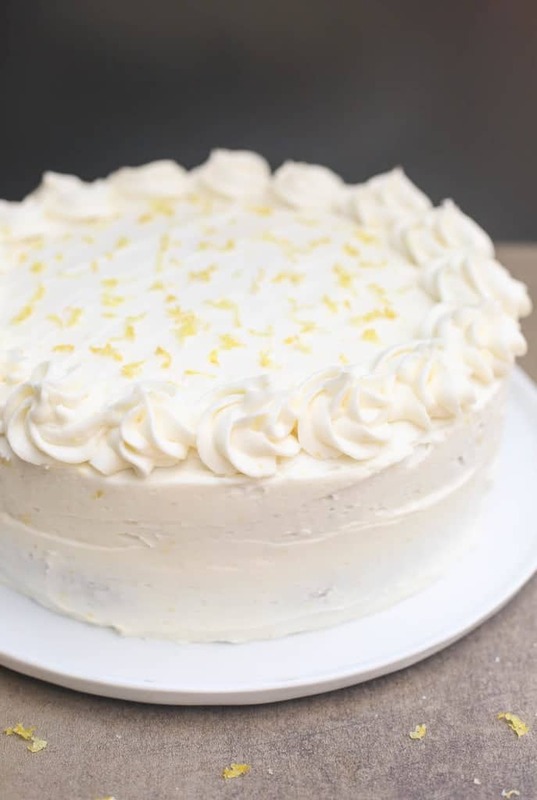 This Lemon Cake looks yummy. Can either be covered iin fondant- or does it lack sturdiness? Have you tried baking this in a bundt cake pan? Please help! I made this recipe using the cake mix but in one one sheet cake pan. It looked fine when I took it out but 15 min. later it fell!!!! I needed this for a birthday party Friday and want to try again but it’s to feed a large group and a sheet cake would be so much easier. I have NO idea what I did wrong! Help – please respond the sooner the better! Thank you in advance. Hi Cynthia, what size pan did you make it in? What is your elevation? I would suggest making it in a 9×13 pan and add a few tablespoons of flour to the batter. Your from scratch recipe sounds good to me. I have been looking for a new one to try. Question: As I like to make tall layer cakes, do you think doubling to get 4 6″ layers? And, have you replaced the vanilla with lemon extract? Thank you. It makes sense that that should work and I think it will be great to replace the vanilla with lemon extract! Hi Lauren, and thank you for responding. I did use a 9 x 13 pan. I tasted it (after it fell) and the lemon flavor was absolutely phenomenal! Thank you for suggesting adding some more flour. A friend thought I had not baked it long enough although it seemed fine when I first removed it from the oven. I will try again and report back! I have no idea as to my elevation, but live near Fredericksburg, VA, just about an hour from our nation’s capital of DC. Yes, that should be fine. I’d guess cooking time will be around 50-55 minutes. Enjoy! This is now my favorite lemon cake. Made it for a friends birthday and I had to make it again and again and again. Perfect recipe. Thank you! That’s so nice to hear! Thanks Jenn!